Writing successful blog posts is not just a matter of creating content. To make sure, your blog posts get real attention, this 7-step-guide and checklist will help you to turn a good blog post into gold. "The emerging marketing epoch defined when exponentially increasing volumes of content intersect our limited human capacity to consume it?" What does this mean for bloggers? Is there still a chance to get to the top of an ever growing blogosphere? Yes, there is. But it also means you will have a lot of more things to consider before and after hitting the publish button. 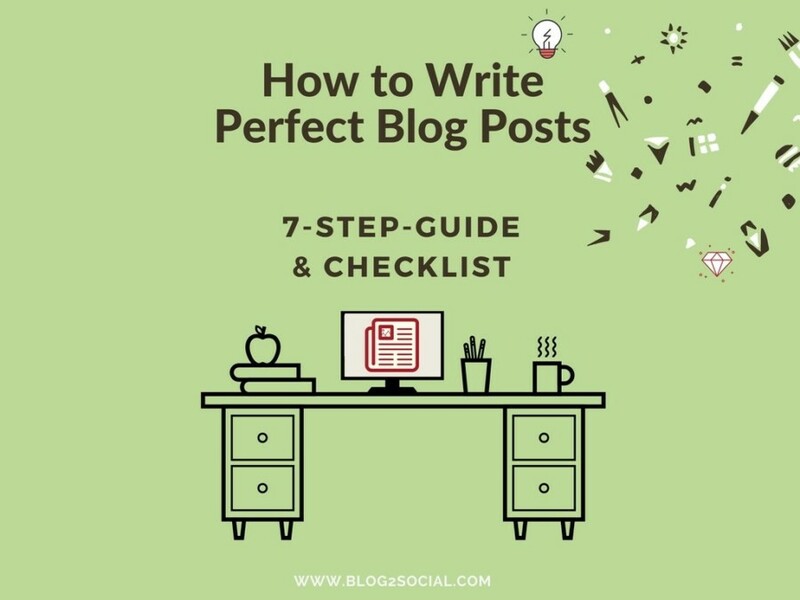 This article will help you with a 7-step-guide & checklist to make sure you create valuable blog posts for your target audience, to optimize your posts for better readability and search engine indexing and to maximize your promotional efforts for more outreach and performance. In the age of the semantic web (web 3.0), relevancy is more important than ever to hit your target audience. Take your time before writing on any topic of general interest. It is somehow very tempting to write a post on a topic of general interest. But you will be more likely to succeed if you focus a specific niche topic for a specific target group. If you try to write for everyone, you will end with no one. The better you know your audience, the better your post will catch the attention of your target readers. Your headline and introduction are most important to grab the attention of your target readers, so make sure you spend enough time to create a catchy title and an introduction that will make your readers want to read the rest of your post. Summarize what your post is about. Outline the topic and your key arguments, but keep the suspense. A well written and properly formatted blog post will maximize readability for your readers as well as for search engines to index your blog post for matching searches. There is no perfect length for a blog post, however, make your blog post as short and precise as possible and as long and detailed as necessary to get to the bottom of your topic. Keep your sentences short and easy to understand. Keep your language simple and stay within the language usage of your target audience. Listings, italics and bold help to outline and highlight important aspects and keywords. Segment your blog post into paragraphs with strong sub headings. Identify the keywords for your topic that will most likely be keyed in by your target audience for the search to get information on your topic. Only if you apply relevant content with relevant keywords in your blog post, your blog post will get found by your target audience. Select synonymous keywords and check the search volume for each keyword or keywords phrase (you can use the Google Adwords Tool for this). Most importantly include your focus keyword in your headline and introduction as well as in subheadings and copy. Use your focus keyword also in image and video title and descriptions. Don't overstuff your text, keep a keyword density of 1-3%. "A picture is worth a thousand words". This proverb has never been truer that in the age of the social web. Visual content becomes more important than ever to capture the attention of today's media consumers. Photos, images, and graphics trigger emotions and make complex information easier to understand and more memorable. Visual information is perceived on a higher emotional level than using plain texts. Your readers will understand better the concepts that you are outlining in your blog post if you visualize your key aspects. Images are more likely to be liked and shared than plain text. So, images will drive more traffic to your post from social media sites. And, images with relevant keywords will also help you to get more matches in the search engines like Google image search or YouTube. Only use relevant images for your content and don't overstuff your blog post with visuals. Once you have managed to drive people to your site, your want them to stay as long as possible. The best way to do this is to guide them to further readings on your site. Once you have published your new post, don't sit back and wait for your readers to come in in millions. You will need to promote your post to get outreach and performance. as hell. Start by sharing your blog post on your social media channels. Social media are very powerful sources to get more outreach for your content and to drive traffic to your blog. You should also re-purpose your content as much as possible and re-share it with all your media formats to extend the lifetime of your post. Reach out to influencers to present your post or link to in and to your post. Like, share and comment their posts to get attention, response, and backlinks to your post. Note: Each social network offers different options for promoting your content and communities react differently to post formats. Each network is used for different purposes and has rush hours at different times. To effectively cross-promote your blog posts, don't just cross-post the same message on every social network. Tailor the message for your posts to fit each social media platform and audience. Get the Complete Guide to Social Media Sharing: What, When & How to Share to help you set up your cross-promotion plan and how to use tools to help you with this task.